Its been a while since we talk Mike's mom on the phone. So i decided to print new photos of Dustin and us to send to her. Hope still not late to send her new photos of us, we miss her a lot and i am sure Dustin miss her Grandma. Mike's mom live at Michigan, its very far from her. Hopefully we can see her again next year. I was so fortunate to have mother in law like her. Im always thankful that she accept me to their family and she love his grandson Dustin so much. Thanks mom! we love you! My sister labored her second baby yesterday, its 7.1 lbs baby boy. I am very happy to know that she already labored. 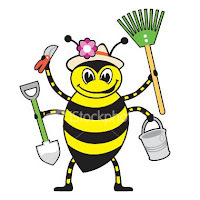 I thought she will going to labor end of this month but she told me that yesterday morning at 3:00am, she is on hard labor because blood came out first. So, my mom bring her to the nearest hospital at DMC (Davao Medical Center). My brother in law was not there because he work at Panabo and my younger sister went to her friend house that’s why my mom is the one who bring her to the hospital and they called my auntie (sister of my mom) to watch the house while they are gone. Im glad she is fine and she have a healthy baby boy. They named him dave jhon, cute name huh? 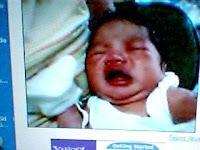 I just saw the baby at the webcam and I saw him crying. I think he don’t want to be expose at the webcam. Wish I could see my niece. 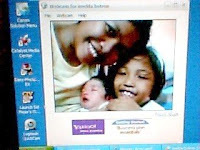 But anyway, this photo taken from my webcam. 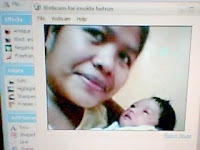 Its not so clear but the baby really looks so cute! hehe :-) Welcome baby! Dustin hair is kind a bit curly and messy. I think he got that hair from his daddy, Mike has curly hair too when he was a kid. This is the 2nd time i cut his hair. I like to shave his hair because he look better when he is bald. I called him "shaolin kid". I think i like him bald at least i dont need to comb his hair. He look better now than before when he has hair hehe ;-) i know Mike dont agree when i told him that i cut Dustin's hair this morning but i told him dont worry because next time i wont shave or cut his hair, we will let it grow and see how he looks like when he grow his hair long. This is a photo of Dustin, the first photo taken yesterday and the second one is his new haircut taken this morning. My menstrual period already delayed for this month. It used to be last Friday, so i need to wait until end of this month to make it sure if i am pregnant or not. My doctor said, i need to wait 3-4 months after my miscarriage but what about if i get pregnant now? I think its still normal if you get pregnant after 2 months of your miscarriage right? Anyway, we are hoping that we will be successful this month. We really want to have 2nd child and hopefully its a girl. My first miscarriage is very depressing because we are expected with that child but when the miscarriage happen, we cant do anything about it, we need to accept and keep on trying. I know its hurt but i need to move on and be happy. Right now, we are enjoying work out together, be a happy couple and spend time to our lovely son. I really missed Philippine Beef Soup. So I decided to cook beef soup for lunch today. But, I don’t have enough ingredients. I called mike and told him that maybe I can go to the store with Dustin to buy the things I need for my beef soup. I don’t drive yet because I don’t have driver license, so Dustin and I walk to the store at city market, few blocks away from the house. I bring the stroller with us so that its not hard for Dustin to walk, when he get tired then he can ride the stroller. I got the things I need but I was confused how to start. Well, anyway I do my own way, I put the onions and garlic with water. When its boiling, I add the salt and pepper to taste and add the beef ribs. After few minutes I added tomatoes and potatoes. When its almost done I add the Chinese cabbage and add fish sauce. It turns out good though hehe. 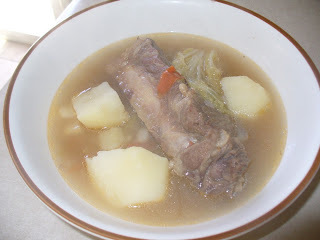 Its been a long time I never cook beef soup but im glad It turns out okay, so I have beef soup for my lunch! Dustin first movie at the theater is "the Incredible Hulk". We watch this movie last Saturday. We cant wait to see this movie thats why we decided to watch it at the theater. I thought they wont allow kids ages 2-3 years old but i was very surprised because they allowed it here. In the Philippines its different, they wont allow kids to watch movie if they are not ages 4 in above. Anyway, Dustin enjoy watching movie with us. He is very serious and quiet. He always say "wow" and "oh no" everytime he see helicopter, cars and the 2 monster (the hulk and abomination). That fight scene is really great! we love it. I think this movie is better than the first and the second Incredible Hulk. If this movie is out on DVD? i am sure we will going to buy one. I want to see it again and i think Dustin will love to see this movie again too. If you never see this movie yet? go to the nearest theater on your area and watch this movie. You dont want to missed this movie! I was very surprised when i take this survey from dNeero, I cant believe that there are people who wants to sell their citizenship. Well, maybe they dont want it anymore or maybe they want to help people who need the citizenship. And for me? i dont have any plan to sell my citizenship. Actually i dont have my US Citizenship yet because i been here in US for almost 2 years, i only have temporary residency and next month i need to renew my citizenship. We need to do that this week though. Maybe after 3-4 years i will take the exam so that i will become US Citizen. Morning until afternoon, I felt very sad. Maybe I can still remember about what happen yesterday in the restaurant. I feel embarrassed because Mike left in the restaurant even though I am not done eating yet. I understand why he does that, I know he feel embarrassed every time Dustin scream and cry at the restaurant. He says it wont happen again because we will never go eat in the restaurant anymore. It hurts me you know but I need to let it go and forget it. So instead of thinking about what happen that time, I decided to keep myself busy. I just watch TV with Dustin, play the puppies outside and at 6-7:00pm, I request Mike to turn the mower so that I can cut the grass in our front yard. I pull some of the weeds also. It was fun and it helps me forget everything. Mike help me out and it seems like nothings happen. Its kind a weird though, but its okay at least we’re okay now. Misunderstanding is one of the common problems for the couples. Its natural that husband and wife misunderstand each other especially if one of them don’t agree for something. They ends up arguing and fighting. Sometimes if they never solve the problems, it will get worst after. Just like my husband and I relationship. He always misunderstand me and I don’t like to argue with him that’s why I better not to talk with him and try to forget it, but sometimes when he hurt my feelings, it takes me a while to recover. Im glad he always approach me and of course as a couple, we try our best to solve the problems we have and try to move on. Yesterday, I am very upset because of what happen in the restaurant but we’re okay now. I try not to talk with him because I don’t want to talk about it anymore. Hopefully it wont happen again, if does? I don’t know what will going to happen. I am sure, we will going to have a big trouble on our relationship. I know its normal to get body pain after workout. Yesterday Mike and I workout at Gold’s Gym and I think I over workout hehe… I used many kinds of workout facilities. And I am very confused which one to use and what to do next. Mike told me that I need to focused and concentrate the workout, he said workout is not a game. If you are willing to built some muscle, for example you need to start on legs and arms then the rest you can do it next time for your next visit. Don’t workout with all your body parts in one time because it will give you so much pain especially if you didn’t do it right. Yesterday I workout a lot. I work with my back, arms, legs, abs and chest. Right now I feel so much pain. Its my fault though because I get overwhelmed to all workout facilities they have. Tomorrow, maybe we can workout again, so we do alternate this time. If we cant go tomorrow, I am sure we will go Friday. I never go workout before, so my muscle is not used to it. I cant even carry heavy equipments and do heavy works. They said my body is fit and healthy because I don’t get sick that much. But even though I am petite, I still need to go workout and be physically and mentally fit. When I married Mike, I learned to go workout but not all the time. Only if he go workout too. I want to workout when I am with him to make me feel confident about myself and try to built a muscle too. Actually I don’t need to lose weight. I am petite but my muscle is not that strong that’s why I need to work with my muscle and be physically fit. I feel good about myself now. Mike and I workout 3 times a week. We are so happy that Gold’s Gym here in Grand Junction area is now open and they have all the facilities you need to workout. They also has nursery, pool, sauna, steam, cardio cinema, basketball court, classes and more. We pay $15 a month so its not that much. Its really worth it. I am looking forward to workout again together with Mike next time. I was cooking rice for our lunch but then I forgot. I been busy doing my stuff online and then when I smell something. It reminds me that “ohh what’s that smell? Did I cook something?” and I remember right away that I cook rice. I run right away to the kitchen and check it out but then its too late because my Rice is burned. Im glad I smell it coz if not? Maybe it’s a big trouble. Our house will be on fire if that happens. Im glad nothing happens. I admit its my mistake, this is not the first time though, I think this is the 3rd time that my Rice is burn hehe. Next time I need to make sure that before I use computer, I need to check it first that the stove is off and the Rice or anything I cooked is done. it’s a good lesson for me about what happen today. I need to be careful next time. Do you know who Stella is? Stella is the name of the female brindle mastiff, she is puppy number 8. The owner gave her a name “Stella”, they are our first buyer who reserve the puppy. Stella cost $800 and they gave us deposit for $100. Stella is really a big girl, she is the biggest female mastiff. I think they really had a best choice. They are happy with the results. When they see Stella? 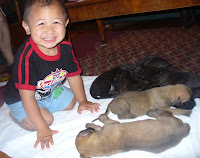 they are very happy to see that the puppy they choose are really growing so fast. Its really worth with the money they payed. They will take the puppy home first week of July. They will be 2 months old this July 07. I am sure her little girl “Lily” would be happy if they will bring Stella with them this coming first week of July. They will come back here next month to get Stella. I will gonna miss puppy number 8 because she is my favorite. At last! i can start earning money with this Blog!". Yesterday, i submit this blog at Bloggerwave then i was very surprised because they approve it right away. Now i can start writing positive reviews at their blog advertising and earn extra cash at the same time. Bloggerwave is the Europes Biggest Advertising Media on blogs. Actually they already approved my 4 blogs and they already pay me for my hardwork and i really appreciate it. So if you own a blog and enjoying doing it? then why not join bloggerwave? This is your opportunity to Make Money online. If blogging is your passion then why not join this blog advertising at Bloggerwave and write positive reviews to their advertisers products and services? Join now and have fun blogging! What do you think of having this latest invention HammeRuler. You dont have to use a ruler and a hammer because at this HammeRuler, they make it 2 in 1 hehe :-) I think this is really good idea, Mike and I has already 2 hammer and 1 ruler, maybe we need this hammeruler so that i can use it also. I am not sure if this one is out in the market or not but if yes then maybe we can give it a try and see how it works. I like this photo a lot. I took this photo this afternoon while Mike is busy watching incredible hulk triller video at YouTube. We're eating grapes that time and i didn't noticed that he has grapes on his mouth while im taking this photo. He looks so funny but he still handsome than ever. We are very happy couple. We always share laugh and smile together eventhough sometimes Mike look so serious. Im a big influence for him because before he dont smile so much. But now? i try my best to make him happy and put that smile on his face. Love you baby! What kids mostly say when they hurt themselves? or if they got a cut? I noticed that most of the kids says "mama, i got a boboo". I trained Dustin to say "ouchy" if he get hurts or got a cut. But Mike says "its a boboo", thats why Dustin say that way also. This afternoon before we had our dinner, Dustin run going to the kitchen and i think he forgot his brake thats why he end up hitting himself on the sliding door and accidentally hit his knee at the side table. He cried after and says "mama ouchy, knees boboo". So i told him nothing to worry about, everything will be okay, mama will put an ointment and band aid. But he never stop crying. So after we eat, i put him on the couch and let him lay down to relax. He wants me to take off the band-aid so i take it off and after a while, he fall asleep. I know he is tired because he didn't take a nap this afternoon. He still sleeping until now, so i transfer him to our bed and later i will transfer him to his crib. Hopefully he will be okay tomorrow and wont feel any pain on his knees. Here are the latest photo of Dustin, this photo taken yesterday. 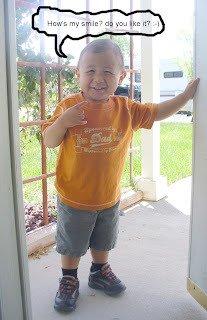 He is ready to go in the car, he cant wait to go out, he always give me a smile and always say "mama cars?". 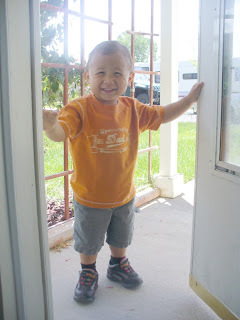 He keep opening the door that time so i decided to take a picture of him while he is in good mood. He looks cutie at this photo though hehe :-) Its so hot outside thats why he got that expression on his face. :-) little chinky boy! - Liars change the subject quickly. - Liars look up and to their right when they speak. - Liars use fewer contractions. - Liars will sometimes stare straight at you and employ a dead face. - Liars never touch their chest or heart except self-consciously. - Liars place objects between themselves and you during a conversation. For me, i dont like liar person and i always want to be honest as much as i can do. I only lie if i dont feel like saying it but of course i have conscience and i know lying is bad. God will not be happy if he see his children (us people) lying. So i try my best to be honest not only for myself and to my loveones but also to those who know me. I am not so crazy about brand name. 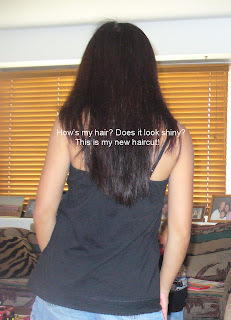 But when it comes to shampoo, soap, camera, computer or something, its hard for me to change it. I am used to it and its hard to make a choice you know. Sometimes, i buy other brands because "i just want to try it". But if i am not satisfied with it, i go back to the brand that i like the most. How about you? are you loyal to your favorite brand? Dustin attitude starting to change this past few days. He always want to do what he wants like going outside without my permission. It scared me to death you know because maybe he will go outside alone. He knows how to open the back and front door. I dont want something will happen to him, as a mother its my responsibility to keep an eye on him and not letting him do what he wants to do. Its part of our discipline to give him spankin if he dont listen to us. He already know how to say "No". If you tell him not to do this, not to do that, dont go there, dont touch it, or if you grab him with his hand. He will say "No" and he will run... hmmm thats not a good attitude. He always got spankin with his daddy. And its time for me to give him spankin too if he dont listen to me. But he is such a sweet boy, i just feel bad everytime i see him crying. 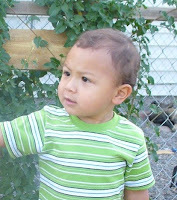 I will try my best to change that attitude, i know at his age of 2, he wants to explore more. I think kids that same age of Dustin does like that. Maybe its normal but when they acted too much, i think they deserve to get spankin and be disciplined. Thanks Jo for passing this tag, i really appreciate it. 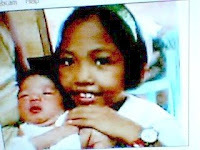 Its nice to share photos especially when it comes to our child. 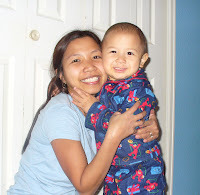 Im proud to be a mommy and i know all mommies feel the same way. So here are some of the photos of me and my 2 year old son Dustin. 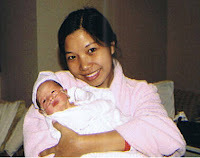 This photo taken last 2nd of January 2006 when i labor our first baby "Dustin Michael". 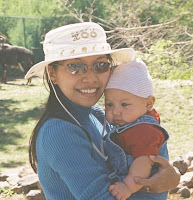 This photo taken at Denver Zoo last 2006. Dustin is 4 months old at this photo. 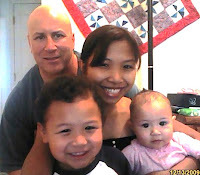 This photo taken last October 2006 when we visit Mike's mom at Michigan. I forgot the name of the place, but the view are amazing in here. Dustin is 5 months old at this photo. 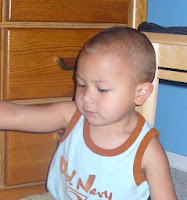 He is bald and really a cutie chubby boy :-) Im proud to be a mommy! This is the latest photo of me and dustin. He is wearing his pajamas because its time to go night2x already when i took this photo :-) He is such a sweet boy. He loves to cuddle and hug me and he loves to smile infront of the camera. 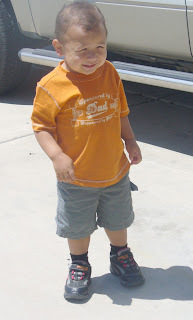 I am passing this tag to all mommies at my Blogroll. Please feel free to grab this tag if you are a mommy. Thanks! Happy blogging to all! Mike love wine a lot, so we decided to buy a grape vine to plant in our backyard near to our window. For me, its hard to choose which one is the best grape but for Mike? it's not hard for him to choose. They have several kinds of grapes that you can choose but we got the Niagra Grapes and Nimrod. Mike bought a book about Wine and its a great book. The title of the book we got is the "Wine Basics". This book will help you learn about winery, what kind of wine to choose, how to taste, how to read wine label and a lot more. They have great wines too here in Colorado especially here in Grand Junction Area. 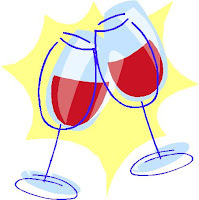 But we never try wine tasting here in our area, hopefully next time Mike and I will visit one of the winery here in Grand Junction and see how good their wine is. Got this tag from Laradee, thanks for sharing this tag, sorry for the late post. So here are my beauty secrets! Please feel free to grab this tag if you read this message. thank you and have a great day everyone! Happy Blogging! My Foundation: Before i used Maybeline Foundation but right now, im using Mary Kay Mineral Foundation. My Day Cream: Olay complete. My Essential Beauty Product: Clean and Clear, Olay cream for my face. Olay Body Wash and Pantene shampoo & conditioner for my hair. My favorite Make-up product: Covergirl, Avon and Mary Kay. My Nails: I like cleaning my toe nails and put color on it but sometimes it makes me lazy to do it hehe :-). My Feet: I always rub lotion on my foot. My hands: I use different kind of lotion in my hands and i also use hand sanitizer. Women I admire for their beauty: I like Melisa Miller beauty, the Victoria Secret Model. My ultimate dream: To be a good wife to Mike and be a good mother to Dustin.